Using the Slow Cooker is a fantastic idea when you have a package of chops and a bowl of veggies. Pork chops come out so tender and fall apart. They are full of so much flavor. Serve over Couscous or Rice. I used a package of 6 thin Pork Chops. Hubs could eat two with no problem, great for leftovers the next day! 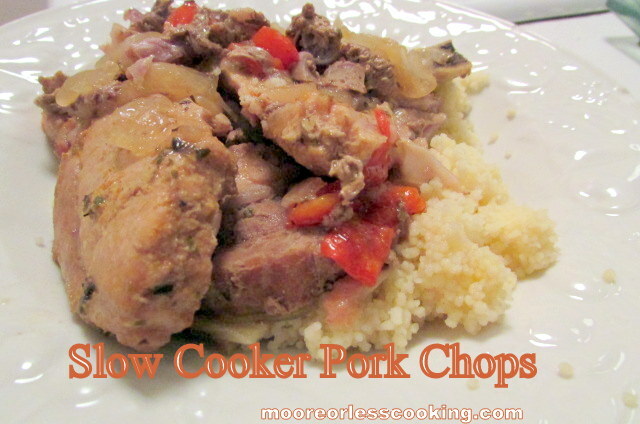 Easy and delicious pork chops cooked in the slow cooker with red peppers and onions, served over couscous. In a Slow Cooker, place pork chops, veggies, seasonings and broth. Cook for 6-8 hours on Low or 4-5 hours on High. I’m always looking for ways to get my pork chops nice and tender and not tough. This recipe sounds great and I can’t wait to try it soon! Thank you for sharing these east and fast delicious looking meals. I am a very busy mom and take care of my parents.